The game had a very big importance for second-ranked WO Boufarik as it allowed them to take a leadership position. WO Boufarik defeated 9th ranked OS Arreridj at home 64-46. Undefeated WO Boufarik (11-0) have an impressive series of nine victories in a row. As mentioned above they are alone now at the top position. OS Arreridj lost fourth consecutive game. They dropped to the tenth place with six games lost. They share the position with El Eulma. An interesting game for NAH Dey (11-1) which hosted in Alger 3rd placed IRB Arreridj (9-3). First ranked NAH Dey managed to get a 4-point victory 66-62. The victory was the seventh consecutive win for NAH Dey. Despite that victory NAH Dey went down to second position due to points difference. IRB Arreridj at the other side keeps the third place with three games lost. A very close game took place in El-Beida between USMB and CRB Dar El-B.. Seventh ranked USMB (5-7) got a very close victory on the road over 10th ranked CRB Dar El-B. (4-7). USMB managed to escape with a 2-point win 77-75 on Tuesday evening. Despite that victory USMB went down to eighth position due to points difference, which they share with Olympi Miliana. CRB Dar El-B. lost their fourth game in a row. They dropped to the twelfth place with seven games lost. Worth to mention about the upset in a game between Olympi Miliana (5-7) and Rouiba CB (3-8), which took place in . Higher ranked Olympi Miliana lost to fifteenth ranked Rouiba CB in a road game 48-54. Rouiba CB moved-up to thirteenth place. Olympi Miliana at the other side dropped to the eighth position with seven games lost. The game between fourth ranked GS Petroliers (8-2) and 13th ranked Ouargla (2-7) in Alger on Tuesday ended with biggest points difference. GS Petroliers outscored guests from 108-68. 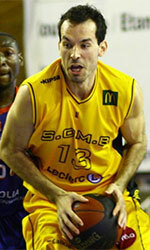 The victory was the eighth consecutive win for GS Petroliers. Defending champion maintains fourth place with 8-2 record. Ouargla lost their fourth game in a row. They dropped to the fourteenth position with seven games lost. There were no big surprises in other games of round 11: bottom-ranked Olympi Batna was smashed by US Setif on the road 84-60. Staoueli won against USM Alger on its own court 71-62. El Eulma unfortunately lost to AB Skikda in a road game 79-85. No shocking result in a game when eighth ranked USS (6-6) crushed bottom-ranked Olympi Batna (2-10) in Setif 84-60 on Tuesday. USS moved-up to seventh place. Olympi Batna lost their fourth game in a row. They stay at the bottom position with ten games lost. The game between closely ranked teams ended with 6th ranked USM Alger's (6-5) road loss to fifth ranked Staoueli (8-3) 62-71 on Tuesday. The victory was the fifth consecutive win for Staoueli. They maintain fifth place with 8-3 record. USM Alger lost their third game in a row. They keep the sixth position with five games lost. The game had a very big importance for second-ranked WO Boufarik as it allowed them to take a leadership position. WO Boufarik defeated 9th ranked OS Arreridj at home 64-46. WO Boufarik (11-0) have an impressive series of nine victories in a row. As mentioned above they are alone now at the top position. OS Arreridj lost fourth consecutive game. They dropped to the tenth place with six games lost. They share the position with El Eulma. There was a small surprise when fourteenth ranked AB Skikda (2-9) won against at home 12th ranked El Eulma (4-6) 85-79 on Tuesday. Despite that victory AB Skikda went down to fifteenth position due to points difference. Loser El Eulma dropped to the tenth place with six games lost.